Hellllllo yumminess. Do you guys remember back here when Abbey first debuted on the blog? Well she's back for her second installment of sharing a sweet recipe with you from her blog, The Butter Half! I just love Abbey and all she offers out of life being a mama and wife but this girl really does it all with her cooking and baking too. 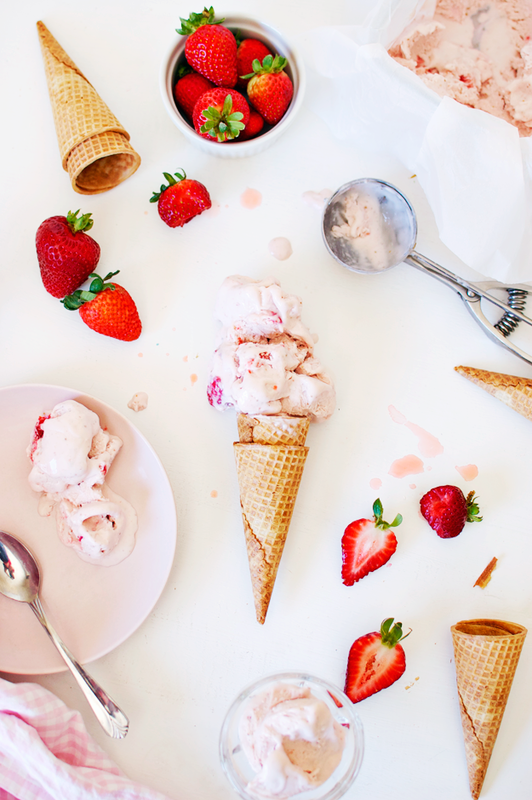 We thought since summer is soon coming to a close, it would be fun to share a quick and easy no churn ice cream you can plan to make for Labor Day or your next BBQ with friends or family. 1. In a blender or food processor, puree strawberries. Strain the puree through a fine mesh sieve if you don’t want the seeds (I don’t strain mine). 2. Mix the condensed milk and vanilla extract in a large bowl. Add in strawberry puree and mix well. Using a stand or electric mixer, beat the heavy cream on medium speed until it is thick and peaks form. Add in the whipped cream to the berry mixture and whisk together thoroughly. 3. 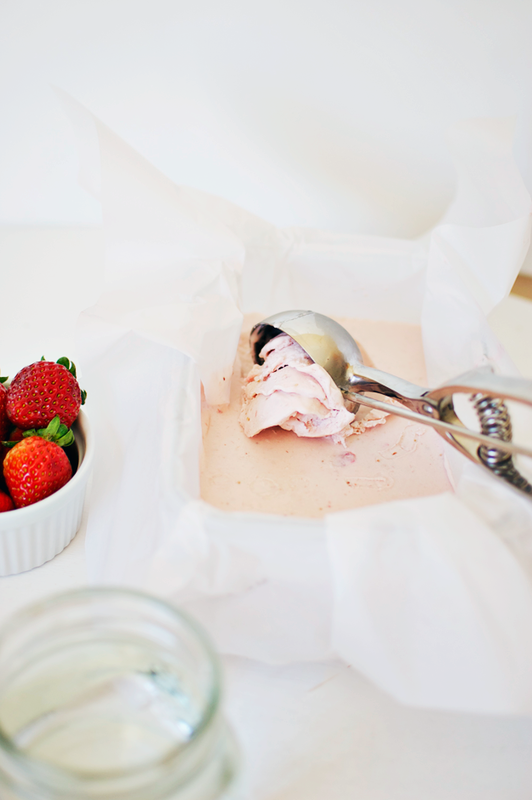 Line a 9×5 loaf pan or glass dish with parchment paper and evenly pour the ice cream mixture into the container. Cover and set in the freezer overnight or at least 8 hours. 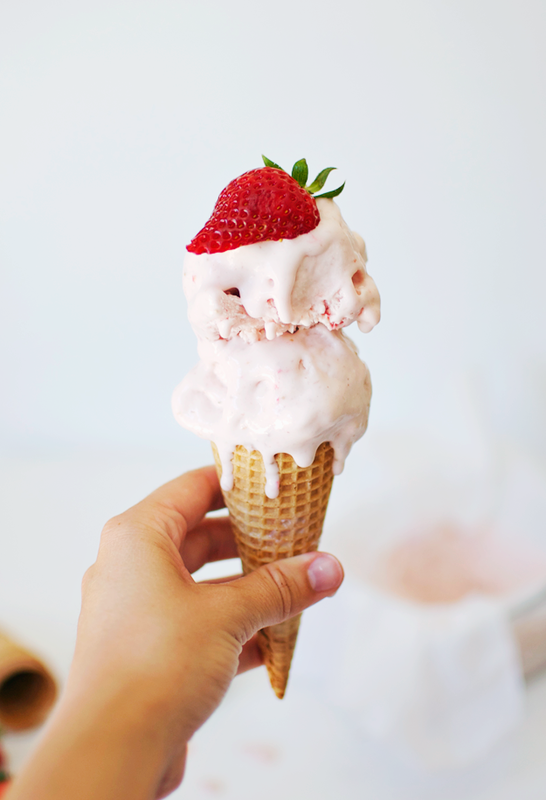 Serve in some sugar cones or in a bowl with a huge dollop of whipped cream. you can connect with Abbey socially!